DNA polymerase ε (Pol ε) is involved in DNA replication, repair, and cell-cycle checkpoint control in eukaryotic cells. Although the roles of replicative Pol α and Pol δ in chromosomal DNA replication are relatively well understood and well documented, the precise role of Pol ε in chromosomal DNA replication is not well understood. This study uses a Xenopus egg extract DNA replication system to further elucidate the replicative role(s) played by Pol ε. Previous studies show that the initiation timing and elongation of chromosomal DNA replication are markedly impaired in Pol ε-depleted Xenopus egg extracts, with reduced accumulation of replicative intermediates and products. This study shows that normal replication is restored by addition of Pol ε holoenzyme to Pol ε-depleted extracts, but not by addition of polymerase-deficient forms of Pol ε, including polymerase point or deletion mutants or incomplete enzyme complexes. Evidence is also provided that Pol ε holoenzyme interacts directly with GINS, Cdc45p and Cut5p, each of which plays an important role in initiation of chromosomal DNA replication in eukaryotic cells. These results indicate that the DNA polymerase activity of Pol ε holoenzyme plays an essential role in normal chromosomal DNA replication in Xenopus egg extracts. These are the first biochemical data to show the DNA polymerase activity of Pol ε holoenzyme is essential for chromosomal DNA replication in higher eukaryotes, unlike in yeasts. Three structurally and functionally distinct DNA polymerases, known as DNA polymerases α, δ, and ε (Pol α,-δ, and -ε, respectively), are required for chromosomal DNA replication in yeasts [1–3]. The complex structure of each Pol α, -δ, and -ε is well conserved from yeast to human , thus their function inside the cell is also believed to be conserved . DNA primase initiates DNA replication by synthesizing a short oligo-ribonucleotide primer which is immediately elongated by Pol α to form short RNA-DNA fragments on both leading and lagging strand of DNA. Pol δ elongates the short RNA-DNA fragment initiated by Pol α-primase to make a mature Okazaki fragment [2, 5]. To carry out processive DNA synthesis in vitro, Pol δ requires PCNA and its loader, Replication Factor-C (RF-C) . In cooperation with Fen1p (Rad27p), Dna2p and RPA, Pol δ also plays a crucial role in processing RNA-linked Okazaki-fragments in budding yeast . Although the precise role of Pol ε in vivo is still unclear, it has been implicated in DNA replication, repair, recombination, and mitosis [1, 2, 4]. Pol ε has at least one essential function in both budding and fission yeasts [3, 6], and several lines of evidence suggest that Pol ε plays an essential catalytic role during chromosomal DNA replication. Yeast cells harboring a temperature-sensitive pol2 allele are temperature sensitive for growth and express a thermolabile Pol ε DNA polymerase activity . Furthermore, Pol2p is associated with replication forks during S phase  and pol2 mutants fail to complete chromosomal DNA replication [7, 9]. Furthermore, 3'–5' exonuclease-deficient mutants of POL2 and POL3 (Pol δ) accumulate strand-specific lesions in chromosomal DNA [10–13]. These observations support models for chromosomal DNA replication in which Pol ε and Pol δ play leading strand- and lagging strand-specific roles during chromosomal DNA replication, respectively. Pol ε has been proposed as the leading strand DNA polymerase because Pol ε is a highly processive polymerase without PCNA [1, 14] and pol3 mutants have defects in maturation of Okazaki fragments . Nevertheless, it has been reported that the amino-terminal portion of budding yeast Pol ε (Pol2p), which includes motifs required for DNA polymerase and exonuclease activities, is dispensable for DNA replication, DNA repair, and viability . However, this conclusion is controversial, because the polymerase active domain mutant (polymerase-dead-mutant) is lethal  and our studies showed that the deletion mutant confers temperature-sensitivity for growth, a defect in DNA elongation, premature senescence, and short telomeres. Furthermore, this pol2p deletion is lethal in combination with temperature-sensitive cdc2 and with exonuclease-deficient Pol δ (pol3-01). These results suggest that Pol ε plays a crucial role in maintaining genomic integrity [17, 18]. In higher eukaryotes, the function of Pol ε is much less clear than in S. cerevisiae, although some reports showed that Pol ε is required for cellular chromosomal DNA replication [19–21]. In order to understand how Pol ε involves in higher eukaryotic chromosomal DNA replication, we have been characterizing DNA replication catalyzed by Xenopus egg extracts [22, 23]. We have shown previously that both the initiation and elongation steps of chromosomal DNA replication are markedly impaired in Pol ε-depleted Xenopus egg extracts, resulting in significant reduction of the overall DNA synthesis as well as accumulation of small replication intermediates. Moreover, despite the decreased DNA synthesis, excess amounts of Pol α are loaded onto the chromatin template in Pol ε-depleted extracts, indicative of the failure of proper assembly of DNA synthesis machinery at the fork . 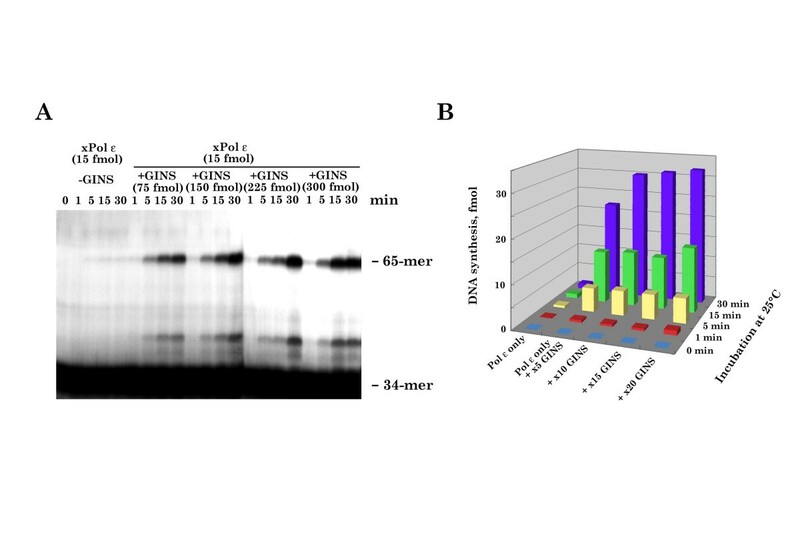 Although these experiments clearly demonstrate that Pol ε is required for a normal chromosomal DNA replication in Xenopus egg extracts, they did not give any answer whether DNA polymerase activity of Pol ε directly involves in chromosomal DNA replication process. In the present report we show that the reconstituted and purified Xenopus Pol ε holoenzyme, which is proficient in DNA polymerase activity, fully complements DNA replication defect of Pol ε-depleted Xenopus egg extracts, but neither DNA polymerase domain deleted Pol ε holoenzyme, DNA polymerase-dead-Pol ε holoenzyme, the catalytic subunit of Pol ε, nor other subunits of Pol ε holoenzyme complements the defect at all. 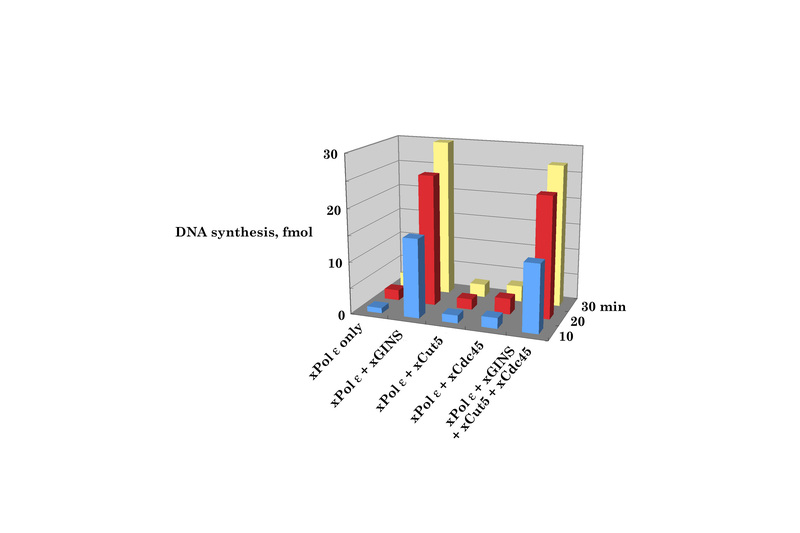 These results clearly prove that the DNA polymerase activity of Pol ε holoenzyme directly participates in chromosomal DNA replication in Xenopus egg extracts and that the products made by Pol ε-depleted Xenopus egg extracts are not fully replicated DNA. A previous study reported cloning of a partial cDNA for the catalytic subunit (p260) of Xenopus Pol ε (xPol ε) , and in this report, the corresponding full-length cDNA was cloned by 5' R apid a mplification of c DNA e nds (5' Race) (see Additional file 1). 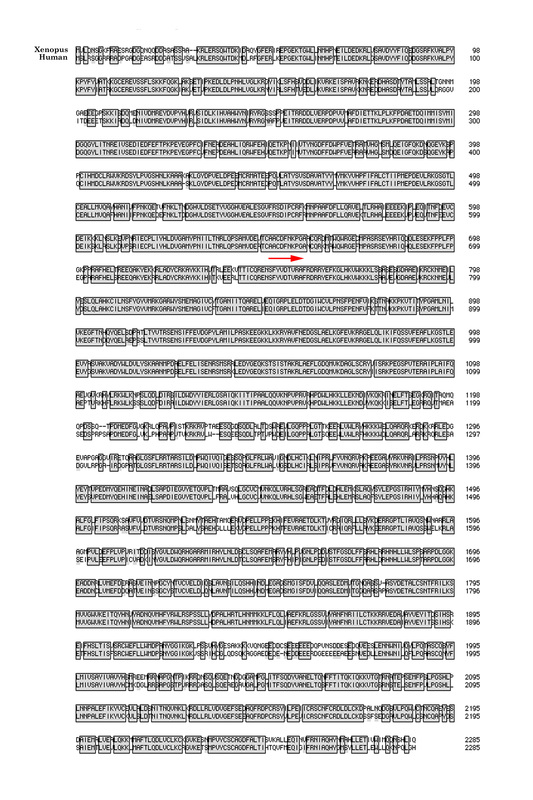 The fact that the full length cDNA encodes a 2285 amino acid residue protein whose predicted amino acid sequence is 81% identical to human p260  and 62% identical to S. cerevisiae Pol2p  within the polymerase domain (see Additional file 2 and Additional file 3) confirms the identity of the cloned fulllength cDNA. Full length cDNA encoding p17 and p12 of xPol ε were also cloned using 3' RACE, Xenopus ovary mRNA and partial cDNA clones 4783571(5') (GenBank ACC# BI349483) and PBX0037B02(5') (GenBank ACC# AW635703), respectively. The predicted amino acid sequences of p12 and p17 showed very high similarity to p12 and p17 of human Pol ε, respectively (see Additional file 4), confirming the identity of the cloned cDNAs. cDNA encoding p60 of xPol ε holoenzyme was cloned previously ; thus, with this report, full length cDNA clones have been isolated for all four subunits of xPol ε holoenzyme. Deletion mutants of xPol ε p260 were constructed and used to identify protein regions involved in the interfaces between p260 and the other subunits of Pol ε holoenzyme. For these experiments, p260 deletion mutants were fused to the FLAG epitope tag (Fig. 1A) and the following mutants were generated: (a) FLAG-p260full, (b) FLAG-p260ΔC2157, (c) FLAG-p260ΔC1054, (d) FLAG-p260D860N, and (e) FLAG-p260ΔCat (equivalent to yeast Pol2-16p [15, 16, 27]). The p260 mutants were co-expressed with xPol ε p60, p12 and p17 using a baculovirus insect cell expression system and immunoprecipitated with anti-Flag antibodies. 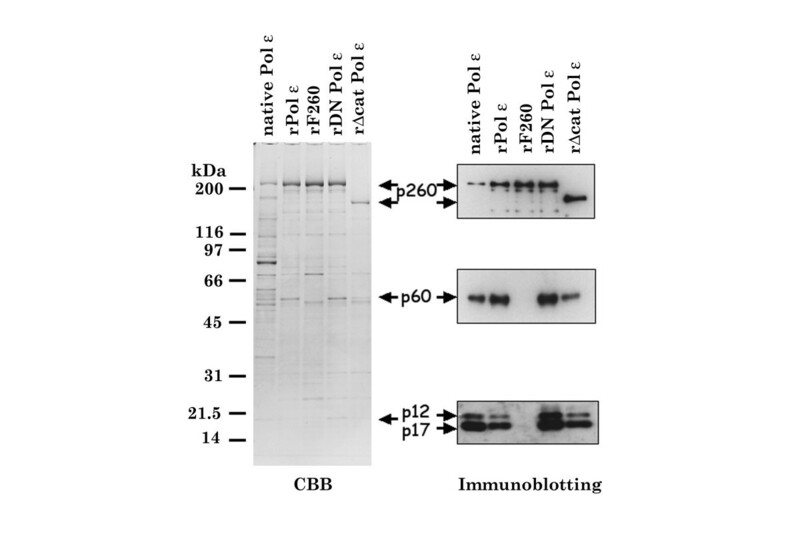 Figure 1B shows that anti-Flag antibodies co-immunoprecipitated p260, p60, p12, and p17 from crude extracts of insect cells expressing wild type p260, p60, p12, and p17. In contrast, in cells expressing p260ΔC2157, p12 and p17 co-immunoprecipitated with the catalytic subunit but p60 did not, and in cells expressing p260ΔC1054, no other subunits of Pol ε holoenzyme co-immunoprecipitated with the p260 mutant protein. 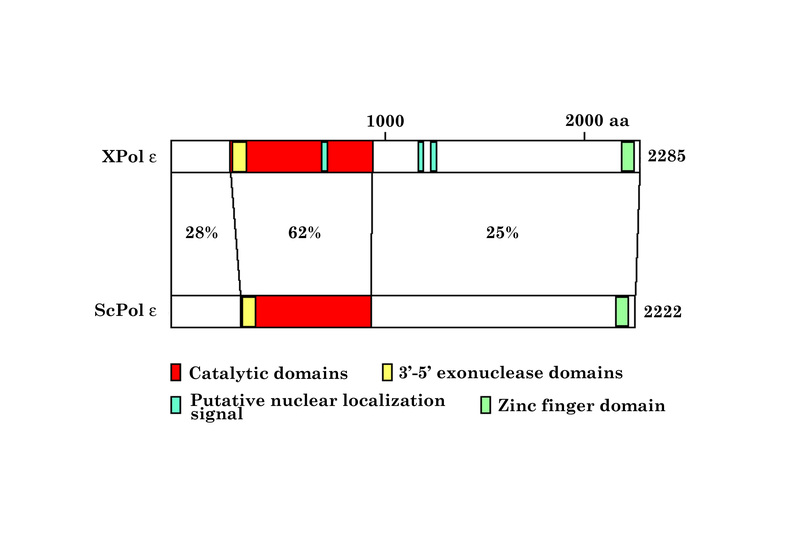 These results suggest that p60, but not p12 or p17, interacts with p260 residues 2157 to 2285, which includes Zinc-finger motifs (Fig. 1C), and that p12 and p17 interact with a motif or region between residues 1054 and 2157 of p260 (Fig. 1C). Both p260D860N (a DNA polymerase-dead-point mutant) and p260ΔCat did not interfere with formation of the xPol ε holoenzyme, because all four Pol ε subunits co-immunoprecipitated from cells expressing these p260 mutants. In cells expressing histidine-tagged p60 (H-p60), p12, and p17, Ni2+ -chelating beads only precipitated H-p60, indicating that H-p60 does not interact directly with p12 or p17, or both subunits (Fig. 3), although it was known that both subunits interact each other and form a 1:1 complex in insect cells (data not shown) as S. cerevisiae Dpb3p-Dpb4p complex . p12, p17 and p60 of Xenopus Pol ε interact with the C-terminal region of p260. (A) Schematic representation of wild type (full)- and mutant (ΔC2157, ΔC1054, Δ860N, and ΔCat) forms of xPol ε p260. The conserved catalytic DNA polymerase domain and putative zinc finger domain of Pol ε are indicated. (B) FLAG-tagged p260 was co-expressed with p60, p17 and p12 in insect cells. Cell lysates were prepared and immunoprecipitated with anti-FLAG antibody and the precipitates were subjected to SDS-PAGE followed by immunoblotting with antibodies for each subunit. "Lysates" and "bound" indicate total protein and immunoprecipitated proteins, respectively. (C) Schematic representation of Xenopus Pol ε holoenzyme. 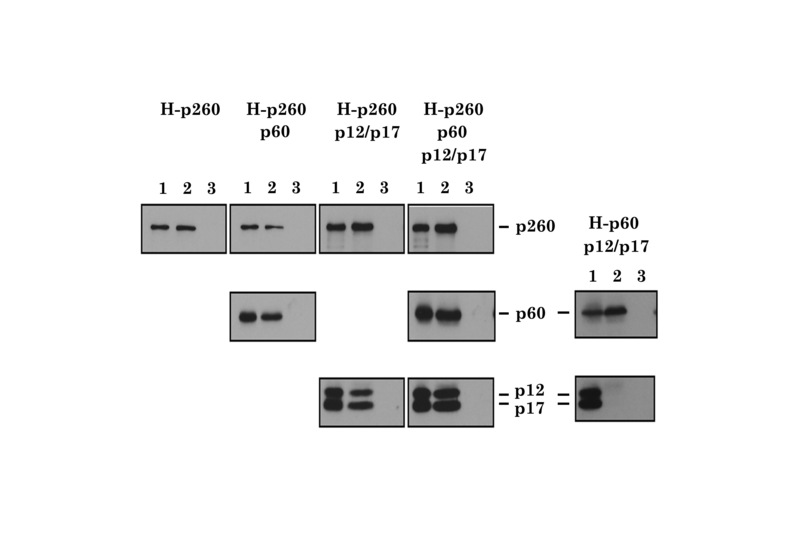 Interactions between histidine-tagged p260 (H-p260) or p60 (H-p60) and other subunits of Pol ε. Interactions between histidine-tagged p260 (H-p260) or p60 (H-p60) and other subunits of Pol ε were investigated using a pull down assay with Ni2+ -chelating beads and crude extracts prepared from insect cells expressing the indicated subunits of xPol ε. Cell lysates containing H-p260 or H-p60 (lane 1) and bound proteins (lane 2) were subjected to SDS-PAGE, followed by immunoblotting with the indicated antibodies. Beads without Ni2+ were also used as a control (lane 3). Previous studies suggested that the amino-terminal portion of yeast Pol ε is dispensable for DNA replication, DNA repair, and viability. Because this portion of the enzyme includes all known DNA polymerase and exonuclease motifs, these results suggest that the DNA polymerase activity of Pol ε is dispensable for chromosomal DNA replication in yeast [15, 16, 27]. To investigate this possibility further, the xPol ε mutant complexes described in Figure 2 as well as partial holoenzyme complexes lacking specific subunits were purified from insect cells and used in an in vitro Xenopus chromosomal DNA replication system with Pol ε-depleted Xenopus egg extracts. The following xPol ε holoenzyme complexes were used: (a) wild type r-xPol ε holoenzyme, (b) Pol ε-DN containing p260D860N, (c) Pol ε ΔCat containing p260ΔCat, (d) p260p60 sub-complex of xPol ε, (e) p260-p12-p17 sub-complex of xPol ε, and (f) p260 (Fig. 2 and 3). The specific activity of each enzyme complex is summarized in Table 1. Although we did not measure the specific activity of p260-p60 and p260-p12-p17 sub-complexes, they were similarly purified as r-xPol ε holoenzyme and p260 and might be the same specific activity as that of p260 alone. Pol ε-DN and Pol ε ΔCat holoenzymes do not have any significant DNA polymerase activity as predicted, although a slight contaminating DNA polymerase activity could be detected (Table 1). This may be due to contamination of insect DNA polymerase activity. It should be noted here that recombinant xPol ε holoenzyme complexes (r-xPol ε) purified from insect cells had minor contaminants, and all enzyme preparations except Flag-tagged p260 included p60, p12, and p17 in amounts that were detected by immunoblotting. Purified xPol ε holoenzyme from insect cells. Wild type and mutant FLAG-tagged p260 was co-expressed with p60, p17 and p12 in insect cells and Pol ε complexes were purified by DEAE Sepharose and anti-FLAG antibody chromatography. Fractions were eluted from the antibody affinity column, pooled and subjected to SDS-PAGE followed by CBB staining (Left) and immunoblotting (Right). Native Xenopus Pol ε (native) holoenzyme was purified from Xenopus egg extracts as described previously . Fractions shown are rPol ε, rDN Pol ε, rΔcat Pol ε, and rF260 (see text). rF260 is FLAG-tagged p260. Figure 4 shows that the extent and rate of DNA synthesis were greatly reduced in Pol ε-depleted Xenopus extracts, and this defect was fully complemented by addition of purified native (n-xPol ε)(data not shown, and ) or wild type recombinant xPol ε (r-xPol ε). In contrast, addition of xPol ε ΔCat or xPol ε DN to Pol ε-depleted Xenopus extracts only partially (30–40%) complemented the replication defect and did not restore normal kinetics of the initiation of DNA replication (Fig. 4). Furthermore, neither p260, p260-p12-p17 nor p12-p17 complemented the defect in DNA synthesis in xPol ε-depleted Xenopus extracts. Of the partial holoenzyme complexes tested, only the p260-p60 sub-complex of xPol ε significantly complemented the defect (Fig. 4). These results clearly demonstrate that the DNA polymerase activity of xPol ε holoenzyme is required for normal, rapid and efficient chromosomal DNA replication in Xenopus egg extracts. DNA replication activity in Pol ε-depleted Xenopus egg extracts. (A) The same number of wild type-, mutant or partial r-xPol ε complex molecule, which has been estimated based on the result of Fig. 2, was added to xPol ε-depleted egg extracts as indicated (see text for detailed description of mutants and partial complexes). DNA replication was initiated by the addition of sperm chromatin and the rate and extent of DNA synthesis was measured by neutral agarose gel electrophoresis followed by autoradiography . The origin (well) is and DNA size markers are indicated on the right. (B) Radioactive material, which migrated slower than the 23-kb marker DNA (shown by an arrow in (A)), was considered to be fully replicated product and quantified by a scintillation counter. Previous studies suggested that Cdc45p, Cut5p, and GINS are critical for loading Pol α and Pol ε onto DNA replication origins and for initiating chromosomal DNA replication in yeast and Xenopus egg extracts [2, 22, 24, 29–31]. However, those studies did not show any direct interaction between these initiation proteins and Pol ε holoenzyme. Therefore, in this study, we tested this possibility by measuring physical interactions between r-xPol ε holoenzyme and xCdc45p, xCut5p, and xGINS. The experiments were performed by incubating r-xPol ε holoenzyme with these proteins and immunoprecipitating protein complexes with anti-FLAG antibody. Figure 5A shows that xGINS was co-immunoprecipitated with Pol ε holoenzyme from reactions containing r-xPol ε holoenzyme and recombinant xGINS . Addition of xCdc45p, but not xCut5p , slightly disrupted the complex between r-xPol ε holoenzyme and xGINS (Fig 5C), and incubation of xCdc45, xCut5p, and xGINS in the absence of r-xPol ε holoenzyme resulted in formation of a heterotrimeric complex lacking xPol ε holoenzyme (Fig. 5B). xCdc45p also interacts directly with xPol ε holoenzyme in vitro (Fig. 5C), and the amount of this complex decreased slightly in the presence of xGINS, but not in the presence of xCut5p (Fig. 5C). These results suggest that the trimeric xCdc45/xCut5p/xGINS complex interacts with xPol ε holoenzyme, and this interaction may involve direct contacts with xCdc45p and xGINS but not with xCut5p (Fig. 5D). Xenopus Pol ε holoenzyme interacts directly with xGINS, xCdc45p, and xCut5p in vitro. (A) Flag-tagged r-xPol ε holoenzyme was incubated with xGINS  for 1 h at 4°C and immunoprecipitated with anti-Flag antibody. The immunoprecipitates were analyzed by SDS-PAGE followed by Western blotting. IP; immunoprecipitates, SUP; supernatant. (B) Increasing concentrations of xCut5p were incubated with xGINS and Flag-tagged xCdc45  or Flag-tagged BAP for 1 h at 4°C and immunoprecipitated as in (A). (C) r-xPol ε holoenzyme was pre-incubated with either Flag-tagged xGINS or Flag-tagged xCdc45p prior to addition of the indicated protein(s). Reactions were analyzed as in (A). (D) A model for the interaction between r-xPol ε and replication accessory proteins (xGINS, xCdc45, and xCut5). Previous studies demonstrated a direct interaction between yeast GINS and yeast Pol ε holoenzyme and that this interaction stimulates the rate and processivity of DNA synthesis by Pol ε holoenzyme . A similar result was obtained using r-xPol ε and r-xGINS . As observed previously for yeast GINS, maximum stimulation by xGINS was obtained at a stoichimetry of 5–10 xGINS/xPol ε (Fig. 6). Under these conditions, however, xCdc45p or xCdc45p plus xCut5p did not stimulate the rate or extent of DNA synthesis by r-xPol ε holoenzyme (see Additional file 5). xGINS stimulates DNA synthesis by xPol ε holoenzyme. (A) DNA synthesis reactions (10 μl) contained 200 fmol 32P-labeled 34-mer primer/65-mer template replication substrate , 15 fmol r-xPol ε holoenzyme and 45 fmol (×5), 150 fmol (×10), or 300 fmol (×20) xGINS as indicated. Reactions were incubated at 25°C for the indicated amount of time, terminated by addition of stop solution (5 μl), and analyzed by sequencing gel and autoradiography . The 32P-labeled 65-mer is the reaction product and the 32P-labeled 34-mer is the primer. (B) The amount of the reaction products in (A) (65-mer) was quantified by Image analyzer (Fiji). Previous genetic studies in yeast suggested that Pol ε plays an important role during chromosomal DNA replication [1, 7–9]. However, because the amino-terminal portion of Pol ε, that is required for its DNA polymerase- and exonuclease activities, is dispensable for yeast DNA replication, repair, and viability [15, 16, 27], the role of Pol ε during DNA replication has remained obscure. This study explores this role using an in vitro Xenopus DNA replication system and wild type and mutant forms of r-xPol ε holoenzyme. Here we show that the DNA replication defect in xPol ε-depleted Xenopus egg extracts is readily corrected by native (n-xPol ε) (data not shown and ) or recombinant xPol ε (r-xPol ε) holoenzyme or the p260-p60 Pol ε sub-complex, but not by p260ΔCat holoenzyme, p260 DN, p260 or p260-p12-p17 (Fig. 4). Because the former enzymes are polymerase proficient, while p260ΔCat holoenzyme and p260 DN are polymerase-deficient, although these preparations contained a small amount of DNA polymerase activity, and the last two sub-complexes do not contain the second essential subunit of xPol ε holoenzyme (Table 1), these results clearly demonstrate that the DNA polymerase activity of Pol ε holoenzyme is required for chromosomal DNA replication in Xenopus egg extracts. 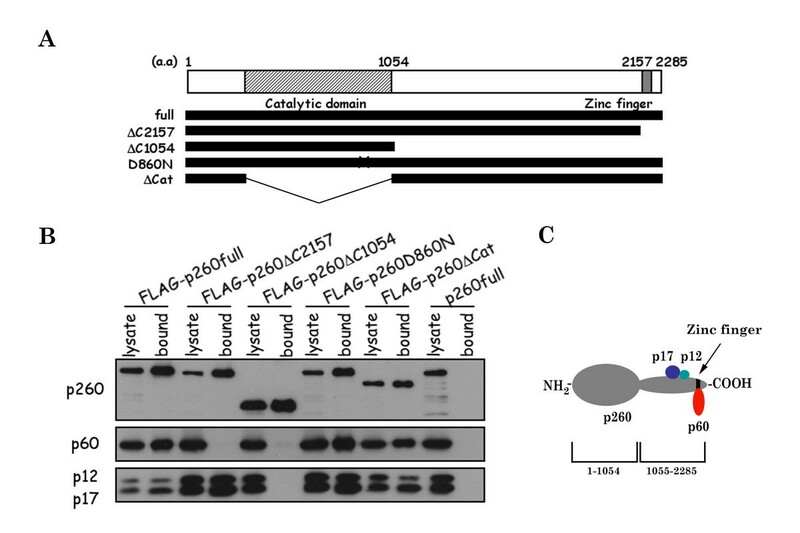 Note that both p260ΔCat and p260 DN holoenzymes partially complements DNA replication defect of xPol ε-depleted egg extracts (Fig. 4). However, these DNA synthesis activities never reach to the levels of either mock-depleted-, n-xPol ε holoenzyme-, or r-xPol ε holoenzyme-supplemented egg extracts even after long time incubation (Fig. 4 and ), thus we conclude that those residual activity of DNA synthesis upon addition of catalytically dead polymerases is not significant to the key issue of this paper. We do not know why n-xPol ε holoenzyme preparations always exhibit higher specific activity of DNA polymerase than that of r-xPol ε holoenzyme (Table 1), although both polymerase holoenzymes equally complement the defect of the Pol ε-depleted Xenopus egg extracts ( and Fig. 4). However, we noticed that the reconstituted r-xPol ε holoenzyme is much more volatile than n-xPol ε holoenzyme during purification (Shikata K and Sugino A, unpublished results). Thus, it is possible that r-xPol ε holoenzyme purified from insect cells would not be fully activated yet and it might be activated during incubation with xPol ε-depleted egg extracts by unknown mechanism(s) and function in the egg extracts as does n-xPol ε holoenzyme. The previous studies showed that a yeast strain consisting of a deletion of the amino-terminal portion of Pol2p (pol2-16) is temperature-sensitive for its growth, has a defect in elongation of DNA replication, has a short cell senescence, has a shorting telomere length, and is synthetic lethal with temperature-sensitive cdc2 (pol δ) mutations and with the 3'-5' exonuclease minus Pol δ mutant pol3-01, suggesting that Pol ε is required primarily for maintenance of genome integrity and that the DNA polymerase activity of Pol ε might be substituted by the remaining polymerase(s), if the polymerase domains are completely missing [16–18]. However, the requirement of xPol ε holoenzyme for chromosomal DNA replication in Xenopus egg extracts is much more strict than that of yeasts and Pol εΔCat holoenzyme cannot restore DNA synthesis activity of Pol ε-depleted extracts to the levels of mock-depleted extracts (Fig. 4) and residual DNA synthesis observed in Pol ε-depleted extracts is not authentic chromosomal DNA replication, unlike yeast systems [15–18, 27]. Therefore, we conclude that the DNA polymerase activity of Pol ε holoenzyme is strictly required for normal chromosomal DNA replication in higher eukaryotes, including Xenopus, but it may not be absolutely required for chromosomal DNA replication in S. cerevisiae and S. pombe, which have a relative small chromosomal DNA. If the above analysis is correct, then it is important to determine whether Pol ε holoenzyme participates in leading or lagging strand DNA synthesis. Although the present study does not answer this question, previous studies are consistent with a role for Pol ε in leading strand DNA synthesis . Furthermore, Cdc45p and GINS associate directly with Mcm2–7p, a DNA helicase that works at the replication fork, in yeast, Xenopus, and Drosophila [33–35], and xPol ε also associates directly with xGINS, xCdc45p, and xCut5p, as shown in this study. xGINS, like yeast GINS, also stimulates DNA synthesis catalyzed by xPol ε. Thus, it is very likely that the DNA polymerase activity of xPol ε holoenzyme, plus xCdc45p, xGINS and xMcm2–7p, perform a coordinated function at the replication fork in Xenopus egg extracts. We propose that this function is required for leading strand DNA synthesis , while lagging strand DNA synthesis in Xenopus may be carried out by Pol δ, PCNA, RF-C and Pol α-primase as well as Fen1p, Dna2p, RPA, DNA ligase and RNase H [4, 5, 36]. 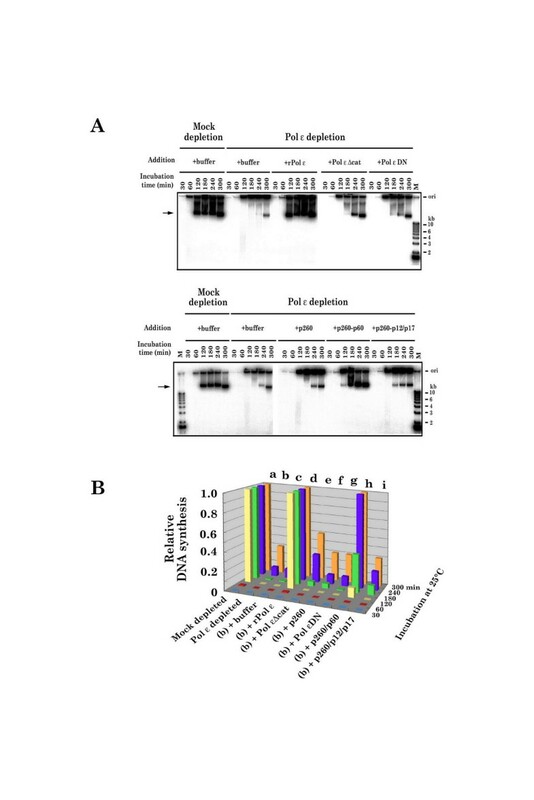 This work shows that the DNA polymerase activity proficient xPol ε holoenzyme complements DNA replication defect of the Pol ε-depleted Xenopus egg extracts. However, neither the DNA polymerase-domain-deleted xPol ε, DNA polymerase-dead-xPol ε, the catalytic subunit of Pol ε nor other subunits of Pol ε without the catalytic subunit complements the defect at all. Furthermore, we show that xPol ε holoenzyme directly interacts with xCdc45, xCut5, and xGINS, which are required for the initiation of chromosomal DNA replication in Xenopus egg extracts. These results are the first, direct and biochemical evidence that the DNA polymerase activity of xPol ε holoenzyme is absolutely required for chromosomal DNA replication in higher eukaryotes, unlike in yeasts. The cDNA for the p260 subunit of Xenopus laevis Pol ε (GenBank accession no. 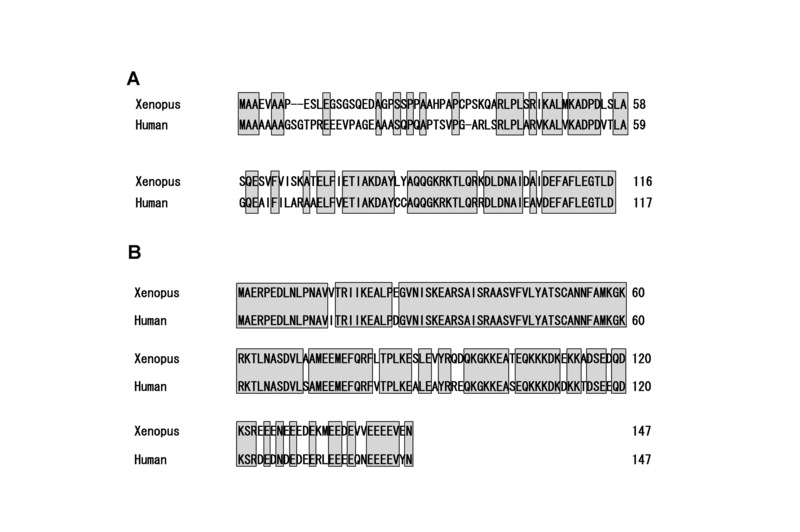 AB259046) was isolated by 5'-RACE using Xenopus laevis ovary mRNA as templates and oligonucleotides primers synthesized based on the nucleotide sequence information of a partial cDNA for the p260 subunit of Xenopus Pol ε . Both strands of its cDNA insert were sequenced with the use of an Applied Biosystems Prism dye terminator cycle sequencing kit and a DNA sequencer (ABI377). The initiation methionine was postulated on the basis of a comparison with the amino acid sequence of HeLa Pol ε p260 (gi:62198237). For cloning of the p17 subunit of XPol ε, the IMAGE cDNA clone 4783571(5') (GenBank ACC# BI349483) was obtained and sequenced. This clone did not contain a complete cDNA insert, so the 3' portion of p17 cDNA was cloned by 3' RACE using Xenopus mRNA prepared from Xenopus ovary (GenBank ACC# AB259047). For cloning of the p12 subunit of XPol ε, the cDNA clone PBX0037B02(5') (GenBank ACC# AW635703) was obtained and sequenced (GenBank ACC# AB259048). Xenopus ovary mRNA was prepared as published , and was used for cloning of the 3'-untranslated region by using 3'-Full RACE Core Set (TAKARA, Japan). The PCR products were cloned into pBR322-based plasmid DNA and sequenced. 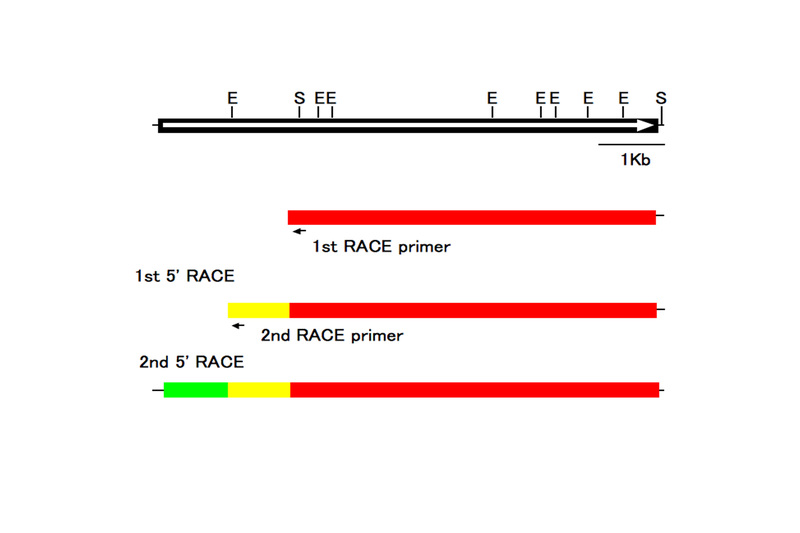 The 5'-terminal sequence was obtained by 5'-Full RACE Core Set (TAKARA, Japan) using Xenopus ovary mRNA as templates. Rabbit anti-Xenopus Pol ε p60 antibodies were affinity-purified as published  and used for making antigen-immobilized Affi-Gel 15 (Bio-Rad). The purified p60 antibodies or whole rabbit IgG (Pierce) as a control was crosslinked to Affi-Prep Protein A matrix (Bio-Rad) (1 mg of IgG per ml of matrix) and used for immunoprecipitation and immunodepletion experiments. Rabbit anti-Xenopus Pol ε p12 and p17 antibodies were raised by using p12 and p17, which were expressed in E. coli and purified, as antigens (K. Shikata, unpublished). Xenopus laevis egg extracts (low-speed supernatant) were prepared as described previously . Immunodepletion was performed by mixing egg extracts three times with the antibody-crosslinked matrix at 4°C. DNA replication with membrane-removed sperm nuclei (2,000 sperm heads per ml of extract) was carried out at 23°C in the presence of [α-32P]dATP as described . The reaction products were purified by RNase A digestion, proteinase K digestion, and phenol-chloroform extraction followed by ethanol precipitation and then separated by 0.8% agarose gel electrophoresis under neutral (Tris/borate/EDTA buffer) condition as described previously . After electrophoresis, the gel was fixed, dried, and subjected to autoradiography. The quantification of replication products was carried out with a Fuji image analyzer (BAS1500). For expression of proteins, 150 × 106 log phase sf21 insect cells were grown in suspension tissue culture flasks. The cells were infected with viral supernatant at a multiplicity of infection of 10 for p260 (a catalytic subunit of xPol ε complex), 5 for p60 (the second subunit of xPol ε complex), 5 for p12 (the third subunit of XPol ε complex), and 5 for p17 (the fourth subunit of xPol ε complex). After a 2-day incubation at 27 °C, cells were harvested, washed once with cold 1 × Tris-buffered saline, flash frozen in liquid N2, and stored at -80 °C. The frozen cells were thawed once on ice and then resuspended in 5 ml of buffer A (50 mM Tris, 150 mM NaCl, 5 mM EDTA, 20% glycerol, pH 7.5) containing 20 μg/ml leupeptin. After lysis, cells were kept on ice for 15 min and centrifuged at 12,000 rpm in a microcentrifuge for 10 min, and supernatant was recovered. Pol ε complex was purified from insect cell extracts with DEAE sepharose column, followed by anti-FLAG antibody column. Native Xenopus Pol ε (n-xPol ε) was purified from Xenopus egg extract by 4 sequential column chromatographies as published . Throughout the purification, column fractions were assayed for DNA polymerase activity with the use of [α-32P]dTTP and oligo(dT)10/poly(dA)400 (1:19; 0.04 mM nucleotides) as a primer/template and were analyzed by Western blotting. One unit of Pol ε supported the incorporation of 1 nmol of dTMP under the conditions described above. Immunodepletion of xPol ε was performed by mixing Xenopus egg extracts three times with the xPol ε-p60-antibody-crosslinked matrix  at 4°C as published [22, 23], resulting in successful removal of more than 99% of xPol ε holoenzyme including the catalytic subunit p260 as prviously . Various amounts of the n-xPol ε obtained from Xenopus egg extracts or r-xPol ε holoenzyme purified from insect cells and the buffer were added back to Pol ε- or mock-depleted egg extracts as published before . Then DNA replication reaction was initiated by the addition of membrane-removed sperm nuclei (2,000 sperm heads per μl of extract. After incubation at 25°C for various times, aliquots were withdrawn and analyzed by neutral agarose gel electrophoresis followed by autoradiography as published before [22, 23]. 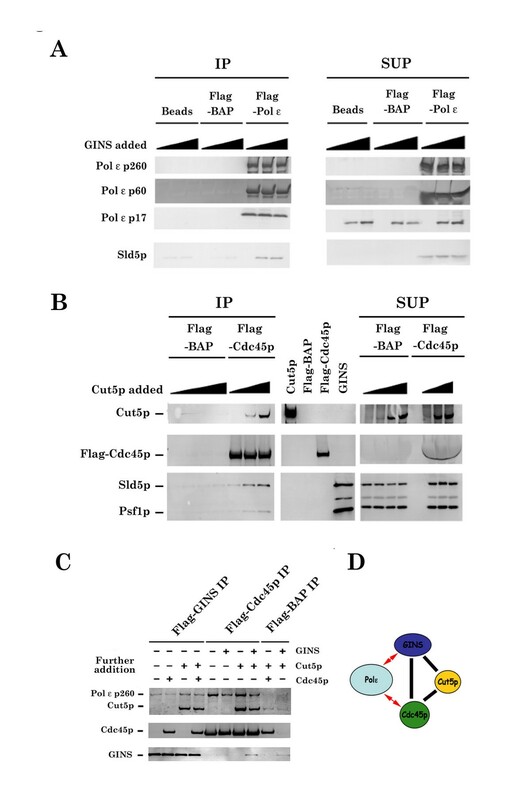 6 × His-tagged Cut5p, 6 × Flag-tagged Cut5p, 6 × Flag-tagged Cdc45p, 6 × Flag-tagged Psf2p containing GINS were expressed and purified from insect cells as described previously [24, 27, 31]. This work was supported partly by grants from the Ministry of Education, Science, Technology, Sports and Culture of Japan to AS. KS carried out the molecular biological and genetic studies, participated in the sequence alignment and drafted the manuscript. TSM carried out the purification of Xenopus proteins from insect cells and immunoprecipitation assays. YO participated in preparation of Xenopus egg extracts. SW participated in the design of the study and discussion. AS conceived of the study, participated in its design and coordination, performed some experiments, and helped to draft the manuscript. All authors read and approved the final manuscript.